There are different types of stretching. These are dynamic (moving) and static stretching. Each should be done during different times during your workout. For example, the static stretch should be used at the end of a workout to increase range of motion (ROM). Dynamic stretching can be done at the beginning of a workout and is important to do after a 'go until you sweat' warm-up. Flexibility is defined as a joint's ability to move freely through a full and normal range of motion (ROM). This refers to passive stretching where a stretch is held in a specific position for a certain amount of time. This time is usually 15-30 seconds in length. 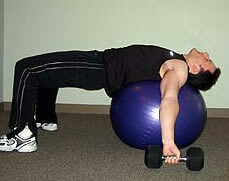 Dynamic muscular movements, such as a bouncing bent over hamstring stretch (advanced athletes). This is used to increase range of motion but is dangerous if you are not warmed up. If you are learning how to do the splits, this type is used for getting there. NOTE: Ballistic stretching contracts the muscle to protect it from hyper-extension. What are good dynamic stretches before a workout? Perform dynamic (arm circles, trunk rotations etc.) stretches before exercise will help prevent injuries during actual exercise. What is a sample end of workout static stretching program?